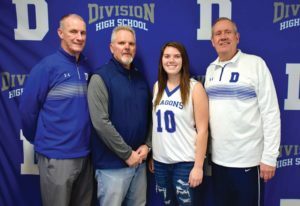 Division Avenue High School senior Madison Gillis is looking at three different colleges to play basketball at the NCAA level. Division Avenue High School senior Madison Gillis didn’t just want her team to win. This game was different. It had the feeling that a special moment would occur. Gillis needed 12 points to do the unthinkable. Only one girls basketball player had done this in the school’s history. But she was on a mission.